This report contains 221 images copyrighted by the WSEAS. All rights reserved. 201 Ross Hall, Auburn, AL 36849, USA. Rector of the Technical University of Cluj-Napoca, ROMANIA. 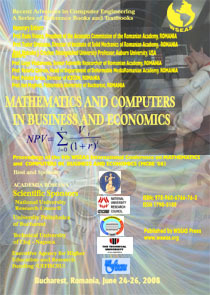 National Institute for Research and Development in Informatics, ROMANIA. West University of Timişoara, ROMANIA. 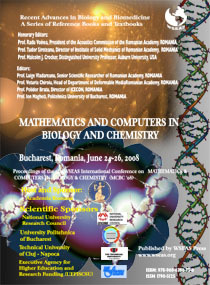 Corresponding Member of Romanian Academy. Politehnica University of Bucharest, ROMANIA. “Politehnica” University of Timisoara, ROMANIA. “Gh.Asachi” Technical University of Iasi, ROMANIA. A permanent username and password for accessing WSEAS conference proceedings on-line for ever. 2) WSEAS provides a very important tool to all the participants; a permanent username and password for accessing WSEAS conference proceedings on-line for ever. 4) Cultural and social activities as customary in WSEAS events. 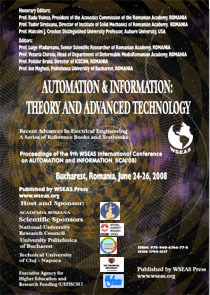 5) The conference Books (Hard-Copy Proceedings), CD-ROM proceedings and Journals (with selected papers) published by WSEAS Press continue to sell for a long time after the meeting has taken place. This is another demonstration of the prestige the scientific community attribute to the meetings organized by the WSEAS. 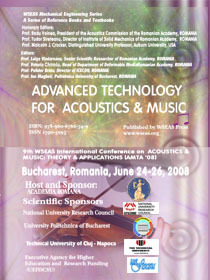 Honorary Editors: Radu Voinea, Tudor Sireteanu, Malcolm J. Crocker. Editors: Luige Vladareanu, Veturia Chiroiu, Polidor Bratu, Ion Magheti. INTRODUCTION: You know that our goal is to maintain very strong international journals, to increase the impact of our beloved WSEAS Transactions, really top journals as they really are. To this end, we need only high quality papers, breakthrough works of archival value, i.e. papers that are well written from any point of view, completed studies (with their numerical examples or experiments that must be compared with the previous results in the literature), excellent English language and of course correct WSEAS format. The papers also must be substantially extended version of the paper that was presented in the conference (with more than 40% new material). We need papers that will attract the attention of other scholars citing them increasing our impact. In the next few years, the WSEAS transactions must be in every academic library, in every corner of the earth. To this end, we need your high quality contribution. a) Check very carefully if your idea is really important, breakthrough in your field and can appear in a Journal of the quality and the level of the WSEAS Transactions. If you doubt, do not send it so easily. Your paper must not be only a good idea. It must be a complete study with theoretical background, complete bibliographical references; without grammatical and syntactical errors. For theoretical works: full comparison with previous published papers is necessary. We need numerical examples, applicability of the method, originality, novelty and directions for future research. For experimental or computational works: full comparison with previous published papers is necessary. We need real experiments with the necessary documentation, while for computational work, we need full benchmarks. Of course along discussions for the applicability of the method, originality, novelty and directions for future research. http://............... (the full web address was given only to authors who presented a paper) So, in this form you will need a password (the password was given only to the authors who presented a paper). From these excellent and well-organized conferences, WSEAS Press published also 4 Books that contain the conference proceedings. 6 coffee-breaks - light lunches: Coffee, Tea, Milk, Sandwiches, Sweets, Cakes, Pastries, Juices were available for the Guests during the conference. A wonderful Gala with more than 50 different courses (self-service buffet) were given to the participants in the evening of the second day of the conferences. Most of the participants danced and enjoyed themselves during this fantastic night.